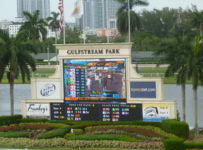 Gulfstream Park on Saturday will hold the first two races in the 2018 Florida Sire Stakes Series for two-year-olds. 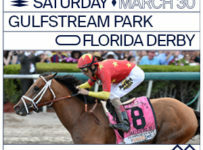 The $100,000 Dr. Fager Stakes is six furlongs on dirt for males. 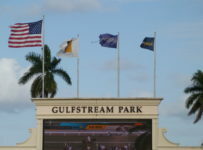 It is Saturday’s 12th race with scheduled post of 6:04 p.m. 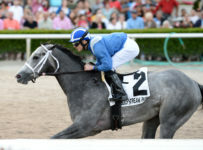 The $100,000 Desert Vixen is six furlongs on dirt for fillies. 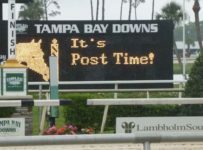 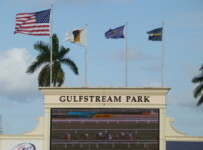 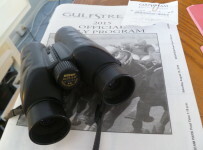 It is the 13th and last race with scheduled post of 6:37 p.m.
First post on Saturday is 12:15 p.m.
We will have previews of the Florida Sire Stakes races on Saturday morning and race coverage on Saturday afternoon. 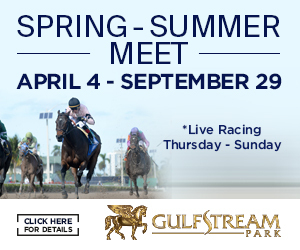 The Florida Sire Stakes (FSS) series has three races for 2-year-old males and three races for 2-year-old fillies. 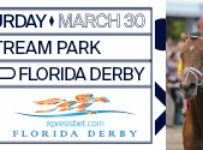 The FSS is sponsored by the Ocala-based Florida Thoroughbred Breeders’ and Owners’ Association (FTBOA), which is the sole provider of purses for races in the series. 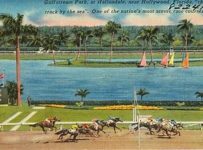 The FSS races are restricted to sons and daughters of Florida-registered stallions whose owners have nominated them for the series. 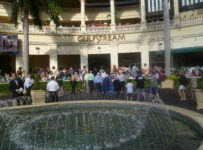 Owners of nominated horses for the races and owners of nominated stallions pay a series of sustaining fees to the FTBOA, which uses that money for FSS purses. 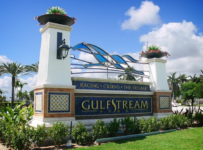 The FSS will continue at Gulfstream on Sept. 1 with the $200,000 Affirmed for males and the $200,000 Susan’s Girl for fillies. 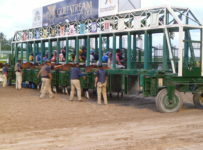 Both races will be seven furlongs on dirt. 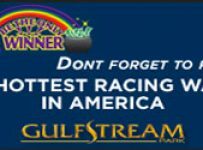 The 2018 series will conclude at Gulfstream on Sept. 29 with the $400,000 In Reality for males and the $400,000 My Dear Girl for fillies. 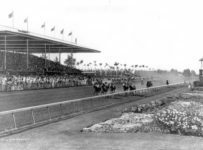 Both races will be 1 1/16 miles on dirt.